David William Duchovny was born on August 7, 1960, in New York City, New York, USA. His mother was a school teacher, his father a writer and publicist who worked for the American Jewish Committee. David has a sister, Laurie and an older brother named Daniel Ducovny, an award winning director of commercials, as well as a director of photography. David attended Yale University where he undertook a Master’s Degree in English Literature. A keen poet and writer, David’s work was well recognized by his peers and teachers while he was in attendance at Yale. He was even nominated for a college prize by the Academy of American Poets for his outstanding work within the literary field. Like any actor or celebrity, David began his career on the bottom, by acting in numerous commercials in the late-eighties. He crossed over into films with bit parts in low key films such as New Year’s Day (1989) and Bad Influence (1990). Although these parts were small and somewhat insignificant, it was a start and David was able to get his foot in the door. In 1991, David got offered the role of DEA Dennis Bryson on the acclaimed TV series, “Twin Peaks” (1990). He only appeared in three episodes, but at that early stage, it was his biggest claim to fame yet, as “Twin Peaks” (1990) was watched by millions of people worldwide. Needless to say, David’s talents as an actor would finally be recognized and he would get the acknowledgment that he so richly deserved. In the early 1990s, he got more bit parts in films, this time, however, the films weren’t “low key”, but hits, such as Don’t Tell Mom the Babysitter’s Dead (1991) and the family favorite comedy, Beethoven (1992). David’s role in Beethoven (1992) was small, but it was hard to forget the poor guy who was dragged across the lawn by the giant St. Bernard! A year later, in 1993, David got the lead role in the independent film Kalifornia (1993). The film also starred another up-and-coming young actor, Brad Pitt. In Kalifornia (1993), David played a journalist who goes on a cross-country tour of famous murder sites with his girlfriend as research for a book he is writing about serial killers. He takes Pitt’s character along to help pay the bills, unaware that Pitt’s character is in fact a serial killer himself. Although it did not do much business at the box office, it is still a great film and has become somewhat of a cult favorite among fans. That same year, David was offered the role of FBI Agent Fox “Spooky” Mulder on the long-running TV series “The X Files” (1993). The show was a tremendous international success and propelled David (and his co-star Gillian Anderson) into super-stardom. His character of Mulder has become somewhat of a pop culture legend and is renowned the world over for his satirical wit and dry sense of humor. Fans loved the fact that he could keep a straight face and still crack and joke in the face of extreme danger. David improvised a lot of his own lines of dialogue while on the show and even penned and directed a few episodes. The series ended in 2002 and still has a strong, dedicated following. To date, David has reprised his role of Fox Mulder in two “X Files” feature films: The X Files (1998) and The X Files: I Want to Believe (2008). During the initial run of “The X Files” (1993), David kept busy and made several films, such as: Return to Me (2000), alongside actress Minnie Driver and the comedy favorite Evolution (2001), with Julianne Moore, Seann William Scott and Orlando Jones. He even had a hysterical cameo as a self-obsessed, simple-minded hand model in the comedy-smash Zoolander (2001). In 2007, after a few years out of the limelight, David struck gold again after landing the plum role of Hank Moody in “Californication” (2007). The raunchy series follows the life of womanizing writer Hank Moody (Duchovny) as he tries to juggle his career and his relationship with his daughter and his ex-girlfriend. 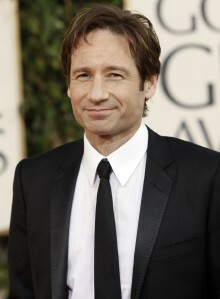 The show has become a hit for its off-the-wall humor and Duchovny’s ability to always turn in a brilliant performance. It may have taken a while, but David has worked his way to the top and notched up an impressive resume along the way. We can expect to see a lot more of him in the future. Do you want to hire David Duchovny? Directly request a quote. In 48 hours we can send you the availability of David Duchovny If you would like to book David Duchovny, Entertainment Booking Agency is the right place. We will offer you the best price and contact the management or we directly contact David Duchovny. For corporate appearances or speaking engagements you can contact our agents and the will help you true the process. Tags: hire David Duchovny, David Duchovny booking, book David Duchovny, David Duchovny appearances, find more information on booking David Duchovny for appearances, David Duchovny speaking engagements, David Duchovny endorsements/spokesperson, David Duchovny appearance fees, David Duchovny booking agency contact info, biography of David Duchovny, Contact an artist booking talent agent find a speakers bureau that can book David Duchovny, speaker booking agency for David Duchovny, David Duchovny booking agency, David Duchovny booking for corporate event. EBA is one of the biggest entertainment booking agencies in the World. We book hundreds of celebrities, artist, athletes and speakers in a year. Important to know is that we are not claiming to be the management of David Duchovny. We are not the official agent for David Duchovny. Companies from around the globe book these artists and speakers true our company be course we have one of the biggest networks and we always have direct contact with the artist or the management. We help you to find the right celebrities for your corporate of private events. Please contact one of our agents to get free advice and we will help to get the world-famous artist on your party.